Shopping for Neon Genesis Evangelion Model Kits? Features multiple points of articulation and interchangeable parts! Snap-fit kit requires no paint or glue. Unit 01 from Neon Genesis Evangelion! 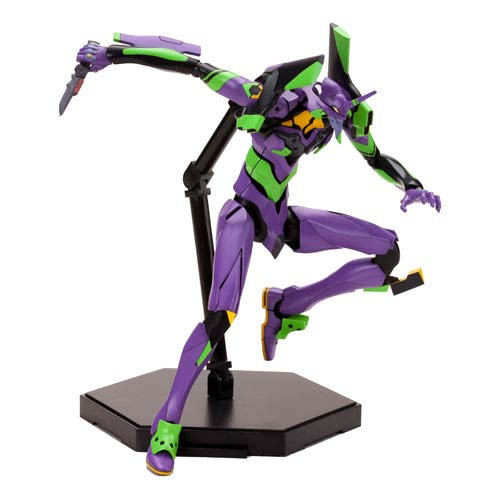 Recreate scenes from the anime TV series Neon Genesis Evangelion with the Neon Genesis Evangelion 7 1/2-Inch EVA Unit 01 Model Kit! Accurately recreated with its purple, black, and green color scheme, this snap-fit kit stands 7 1/2-inches tall, and requires no paint or glue, making it a great kit for beginner and expert alike. With multiple points of articulation and interchangeable parts, this is a fun kit of Unit 01 from the TV show! Neon Genesis Evangelion is a Japanese media franchise created and owned by Gainax. Most of the franchise features an apocalyptic mecha action story, which revolves around the efforts by the paramilitary organization NERV to fight hostile beings called Angels, using giant humanoids called Evangelions that are piloted by select teenagers, of whom Shinji Ikari is the primary protagonist.